When setting up your table with Meze, it's always a good idea to include vegetarian stuffed grape leaves. In the Mediterranean area, it's traditional to set up a table with a lot of small plates filled with delicious food that all gathered can share. In Spain, these plates are called tapas. In Greece and the surrounding area, it's called Meze. Usually, Meze are enjoyed with drinks and with friends. 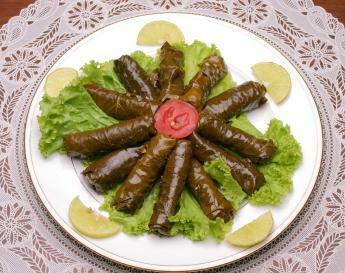 When you are serving vegetarian stuffed grape leaves, you are serving dolmas. Dolmas refers to something that has been stuffed. Dolmas can also be tomatoes or peppers, but in this case it is a grape leaf. Other Mezedes can include Hummus, Kibbeh, Tabbouleh, fattoush, and even artichokes and artichoke salad. In Greece, Mezedes usually include fish plates as well, and it would not be unusual to find sardines or small octopus on the table. Generally speaking, you will find the grape leaves preserved in brine unless you happen to be lucky enough to live near a Mediterranean market of some kind. If you do find them brined, you will have to rinse them at least once in cool water. Depending on the brand, I have sometimes had to soak them a bit to get rid of the excess saltiness. Rinse them once and taste one. If you happen to be super lucky, you will find fresh grape leaves at your market. If so, take the freshest, most tender young leaves and blanch them before you use them. Blanching is when you dip something briefly in boiling salted water. They should become limp after a minute or two. Remove them and gently dry the leaves before use.If you like, you can buy more than you will need for the recipe and freeze them. They freeze well, but do not blanch the ones you plan on freezing. Just wrap them tightly in foil and pop them into your freezer. I have used plastic wrap to wrap them first and I have also just wrapped them in foil and I haven't noticed any difference. I still wrap them in plastic first to protect them in case something spills. Rinse the grape leaves in cold water. Place them in a bowl and cover with boiling water. Allow them to soak for ten minutes. Drain completely. Mix the onion, scallions, parsley, lemon, chilies, fennel, rice, and 1 1/2 tablespoons of olive oil. Take a grape leaf and place it vein side up on your work surface with the bottom of the leaf face towards you. If there is any stem on the leaf, trim it off. Place a heaping teaspoonful of the rice/herb mixture close to the bottom of the leaf. Fold the bottom of the leaf over the rice mixture. Fold the sides of the leaf over toward the center. Roll the leaf like a cigar. Repeat for all the other leaves. Place several leaves on the bottom of a large saucepan. Place the stuffed leaves into the saucepan in a single layer. Drizzle the oil over the vegetarian stuffed grape leaves. Add 1 1/2 cups boiling water. Cover the grape leaves with a plate to help keep them under the water. Place the cover on the pan and simmer for 45 minutes. If you like, you can serve them with Cacik or you can just make this quick dipping sauce for them using with yogurt. I like to use Greek yogurt and, if you can find it, I suggest you do to. It just tastes better. .